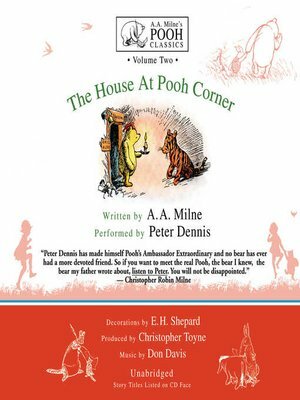 Blackstone Audio presents, from the unabridged collection "A.A. Milne's Pooh Classics," the ten stories of The House At Pooh Corner, performed by Peter Dennis. In A.A. Milne's wonderful companion volume to Winnie-the-Pooh, you will rediscover Pooh, Christopher Robin, Piglet, Eeyore, and all their friends—and be introduced to the irrepressible and very bouncy Tigger. As you begin to listen to this beloved book of A.A. Milne's simple and timeless tales, you'll enter that enchanted place on the top of the Forest where "a little boy and his Bear will always be playing."